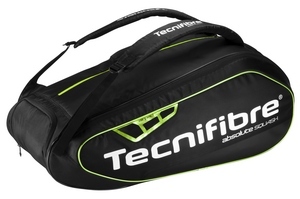 Tecnifibre Absolute Squash 12 Racket Bag is a dedicated squash bag to hold everything. 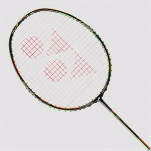 The bag has a huge racket capacity and is made of strong materials to prevent damage to things inside and stop abrasion on the bag. Everything a squash player needs is catered for: ball holders, huge racket pocket, glasses pocket and ventilated clothing pocket. A side compartment is large enough to take spare or used clothing. Airpad on the side ventilates the pocket so used clothing doesnt build moisture inside the bag. On the upper of the bag is a glasses pocket with soft inner lining to protect the lenses from scratching. Energy Pocket - A special pocket on the end has been designed to take energy gels, drinks and small foods for the nutritionally minded player. 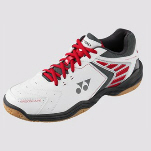 Or fill it with grips and any spares you need for playing. Ball Holder - Three special ball holders on the outer of the bag stop the scramble through to the bottom to find your balls. Small cut outs in the holder mean you can position the balls to see what dots the balls are. Padded adjustable shoulder straps make it easy and comfortable to carry.